Mountain View-based Tynker, a startup focused on teaching children of all ages the basics of learning how to code, is now expanding its service beyond schools with today’s debut of Tynker for Home. This new system is similar to the platform targeting teacher and classrooms which launched earlier this year. 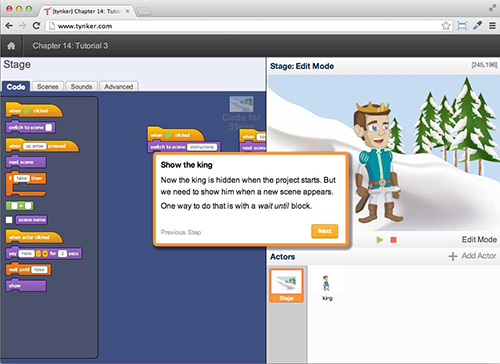 Tynker for Schools, as that previous suite is called, provides web-based software and a curriculum aimed at elementary and middle school students. The new home edition is designed for the same crowd. Also like the school edition, Tynker for Home takes advantage of kids’ interest in computers, but more specifically, games, videos and other more visual content. Instead of trying to teach the actual syntax of a programming language right away, Tynker lures students into the developer mindset by first reducing the complexity of the experience and starting with something fun – building an animated character like a princess or zombie, which kids can then teach to walk, move, and perform other tasks through the use of a visual programming “language” of sorts. This same program involving the creation of animated stories and self-paced learning, is now available to parents who want to introduce their children to programming basics at home. * Update: Tynker founder Krishna Vedati points out that the school edition has some presence in all 50 states now. That wasn’t the point of the above comment, but in case it was unclear in my framing: Tynker is free for schools, but that doesn’t mean the majority of U.S. kids had access. Perusing the large (partial) list he provided, a number of the schools using Tynker appear to be private, including dozens of “Catholic”and “Christian” schools, e.g., or those whose names hint at their non-public, or least charter, nature (181 “academy,” 25 “prep,” etc.). 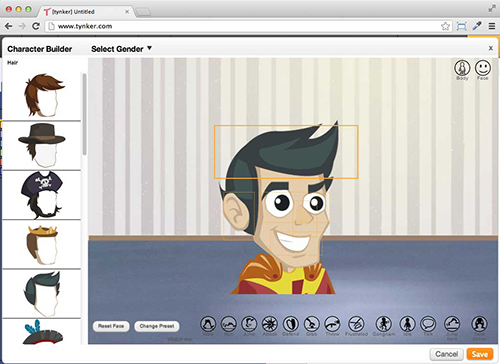 With Tynker at Home, parents can bring self-guided lessons, puzzles, tutorials, quizzes, missions, videos and more to personal computers, regardless of whether or not their kids have any I.T. education at school. The company has also partnered with Dave McFarland, an author of several O’Reilly programming books (including some in the well-known “The Missing Manual” series) to create Tynker’s “Introduction to Programming” course materials. Tynker may not be perfect – the further along the course gets, the more complex and “geekier” it becomes, which may lose kids who don’t have a natural inclination toward math and logic. And despite your lofty goals as a parent, you might still have to force (or bribe – that’s cool, right?) your kids to do the work. That being said, Tynker is also up against a handful of free products, notably MIT’s Scratch (which Tynker is similar to and supports import from), as well as free and paid tools, services, sites, products, and more like those from Kuato Studios, Hopscotch, Pluralsight, Code.org, Light-Bot, UQ Life, and even that Minecraft Raspberry Pi thing, to name a few. But we may as well err on the side of having too plentiful a selection of educational tools, than not having enough. Tynker for Schools has been adopted by over 2,700 elementary and middle schools, reaching 23,000 students. Tynker for Home is open for business here.